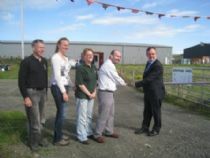 On Saturday 20th August 2011 we had the official Grand Open Day for Steptoze Yard at Garson, Stromness. Steptoze Yard is your community recycling centre, and the site had been open for business since February 2011. But ongoing ground work at the site had meant we hadn't had an official open day. So we thought a summer day would be a good time to have it. Of course with Orkney weather this meant the weather was "fair" in the morning and pouring with rain and windy by lunch time! 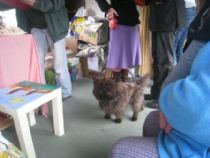 However all at Orkney Zerowaste had a great time and were pleased to see some of our supporters turn up for the fun too. The site was declared officially open by Cllr James Stockan who cut the (recycled) "ribbon". In this photo he's asking what we will now do with TWO recycled ribbons. Oh we'll find a use, never fear! In the photo (from right to left) are Cllr James Stockan, Alan Dundas (Orkney Zerowaste Treasurer), Sarah de Rees (ex-Site Manager), Jenni Kakkonnen (ex-Treasurer) and Andy Bowman (Waste Prevention Education Officer). It was also the close of our "Bruck to Bling" competition. Click here to look at photos of that event. 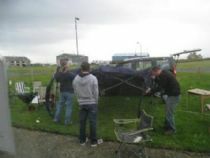 Our trusty team were quick to take down the Orkney Zerowaste gazebo tent as the wind got up. Meanwhile folk gathered for refreshments in our site hut (caravan) and we had our own eco-vacuum cleaner - Peedie was on hand to hoover up any tasty morsels or crumbs that dropped on the floor! 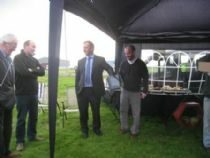 Though the weather didn't put off our composting demostration by Andy Bowman later in the day. Many thanks to all those who donated prizes or attended. You all helped to make it a Grand Open Day!